Mdivi-1 is a selective cell-permeable inhibitor of mitochondrial division DRP1 (dynamin-related GTPase) and mitochondrial division Dynamin I .
Dynasore is a cell-permeable small molecule that inhibits the GTPase activity of dynamin1, dynamin2 and Drp1, the mitochondrial dynamin. Dynasore was discovered in a screen of approximately 16,000 compounds for inhibitors of the dynamin2 GTPase. Dynasore is a noncompetitive inhibitor of dynamin GTPase activity and blocks dynamin-dependent endocytosis in cells, including neurons. 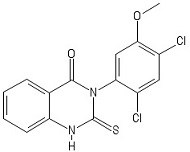 Hydroxy Dynasore is a dynamin inhibitor.